* The boy who has managed to get playdough stuck up his nose, a penny stuck in his esophagus, and a dried bean in his ear, today got a bee wing removed from under his upper eyelid where it was stuck fast and infected. I am considering this an improvement since it was not his own doing that it got there. * Addie is continuing the pattern of our girls sleep great and our boys sleep lousy. She wakes once during the night to nurse and goes back to sleep. I am soooo thankful. * We burned out another major appliance. I'm shopping craigslist today and hoping not to have laundry draped over every available piece of furniture much longer. * In the midst of a low down, no good and terrible day, Annaliese made the kids all pop corn and read them stories. Love her much. I am having chills reading about the bee wing in the eye. A little confused....post more about that when you can. Oh my goodness! She is so kissable! Oh she is so adorable! Babies are addicting! I only half-jokingly tell people this is why we have ten children :) Glad she's letting you get some sleep. She is beautiful.. 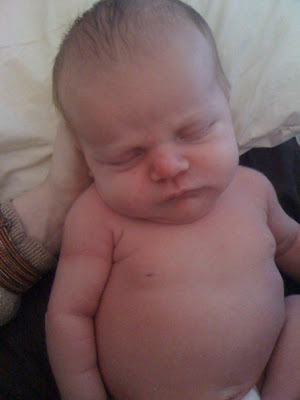 I love LOVE chubby babies..
What a sweet sleepy baby. Thanks for adding a dose of infant to my day.